Our team stitches together all of your data-sources to create a real-time, always-on view of your company that you can access 24/7/365. Want to see an impossible metric? If you are like most companies, almost every valuable metric is ultimately handcrafted. Sure, the underlaying data is easily accessible, but the metric your organization really wants requires that data from multiple sources be combined, calculations performed, and then you actually have what you were looking for all along. Nowsight™ takes all of those spreadsheets and does the calculations for you. Woot. We use the APIs from all of the most popular web-based applications, like Salesforce, MS Dynamics, Quickbooks, and thousands more to import your cloud data into Nowsight™ and give you one true version of where you are and where you’re going. And we normalize the data. When data is created and maintained by different users and groups, references to individual items- like companies and names- will be different. For instance, the accounting department’s systems know all about ‘Acme Widget Co’ but the sales team’s systems refer to them as ‘Acme’. That’s the kind of difference that makes connecting data sources really complex. We fix it. We build custom rules and triggers. Some data should be acted upon immediately, like sales team members that are falling too far behind their quota or low inventory levels for important products. 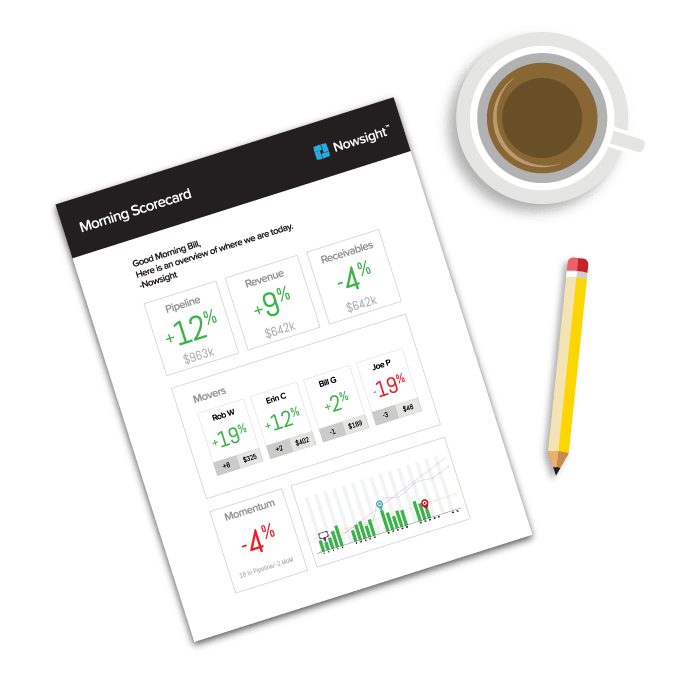 With Nowsight™, we work with you to identify the important metrics and develop triggers that send emails alerts when anything goes awry. Now you can right the ship before it becomes a problem. Choose from a library of data-patterns or we’ll build a new one. We have a huge library of pre-built ‘patterns’ that answer most of our customers biggest business questions. They cover the gamut from Sales, to Marketing, to Operations, and Accounting and many existing patterns tie together data across departments and deliver really powerful views. So while we do have great base of views that are ready to go, if we don’t have exactly what you are looking for, we will build the new functionality specifically for you. There’s no better way to start the day than getting started with a a proactive plan. We help your whole team get every day started with a true understanding of your most important KPIs backed by up to the minute information. Get everyone on the same page, every day. We include everything for one simple monthly fee. transform your organization in 90 days.